← Will I Ever Run a 5K? Yes, that’s my cat. And yes, those are Shannon’s shoes. 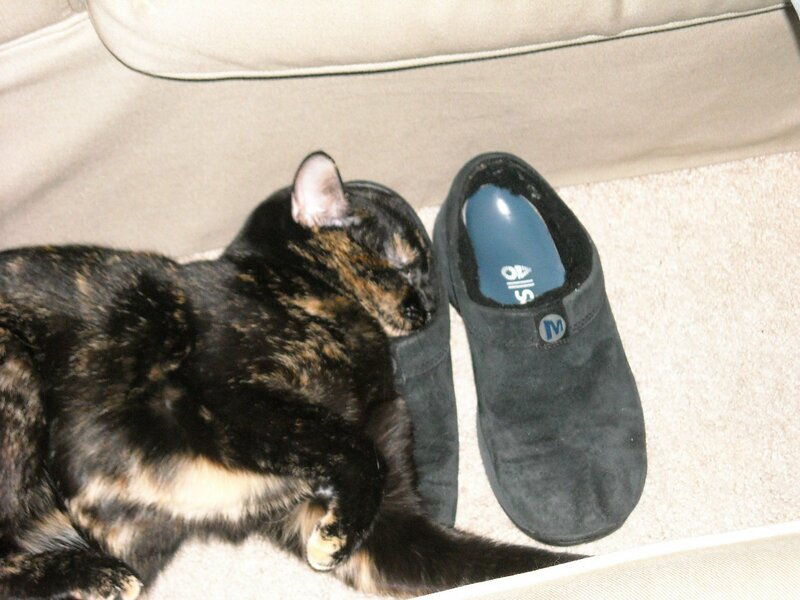 And yes, she is trying to fit her entire head into the shoes. It’s been a very busy, very high-emotion, dramatic week. There have been very bad things, very good things, and very frightening things. Last night was a nice chance to relax and forget about the week, to eat some tasty Japanese food and watch a little TV and zone out for a while. I’m very happy to have the day off tomorrow. I have lots of reading to do for school. I’m reading I, Rigoberta Menchu right now and it’s really affecting the way I view our own indigenous peoples. Her story of struggle as the ladinos stole from them and took their land really makes me think about what life would have been like had the same thing not happened here five hundred years ago. Please bear in mind, I’m not advocating any kind of drastic shifting of land ownership or monetary restitution. I think that, at least in part, our indigenous people have been pretty smart with their taking over the casino realm and I support any dollar that they can make off that (it’s our own responsibility to monitor what we spend our money on; I don’t blame them for capitalizing on our desire for excess). That being said, I do think that we have to go back and recognize that there were points in time in our own history where we did not adequately give others the respect which was due to them and probably took things which weren’t ours by less-than-honest means (and likely violent means also). I think we bear some responsibility to learn about history, to learn where we came from, and to let that view shape where we go from here. There’s a whole wealth of knowledge that remains largely untapped, both because we won’t and because they are too wary to share it lest it be abused. I can safely say that while I do believe that violence sometimes has to be the answer to some problems, learning is most certainly always the first answer. History is a good ‘lesson learner’ to guide future actions, indeed. Education is the route of solving many of our world’s problems – the challenge is transfer of knowledge and getting people willing to receive the learning’s. Some lessons life has taught me, so far…1. If you have your health, you have just about everything.2. Capitalize on opportunities when presented in life; don’t look back and wished you had. 3. Don’t take yourself so seriously, everyone’s important. 4. Successful relationships take a lot of compromise.5. Everything can change in the blink of an eye; live for today, but balance for tomorrow’s. 6. You can get through anything if you stay calm and react after rational thinking. Take a deep breath, relax, and then think before you react. 7. Burn the candles, use the nice sheets, and wear the fancy clothes in the closet. Don’t save them for the special occasion. 8. Over prepare, and then go with the flow and don’t second guess yourself. 9. Frame every so-called disaster with: “In five years, how much will this really matter?” 10. If you care about your friends, make the effort to stay in touch. There’s always time to see or be there for a friend in need.11. Believe in small miracles. Sometimes they occur in mysterious ways. 12. Children get only one childhood. Make it memorable for them. 13. Make your goal and actions to leave this earth a better place than when you came into it. 14. Your heart will tell you a lot, so allow it to guide you.15. Some things are just not meant to be understood why they occur.